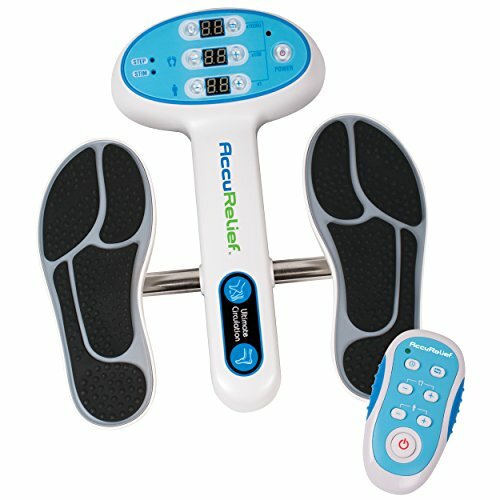 The AccuRelief Ultimate Foot Circulator is an advanced electrical stimulator for home, work or travel. This powerful device delivers prescription-strength relief by relaxing stiff muscles, increasing blood circulation of health muscles, reduces swollen feet and ankles to help you get back to a normal activity level. Poor circulation may cause tired, aching and heavy legs. Most people get tired, aching legs and swelling feet some time in their lives, usually caused by standing or sitting for a long time. The Ultimate Foot Circulator works by sending electronic pulses to the foot or body muscles through foot pads or self-adhesive electrode pads. The physiological result is that the foot and calf muscles contract and release, creating a pumping action. This action imitates the body’s natural circulatory system in the legs while walking. As the calf muscle contracts, blood will squeeze into the deep vein of the leg and push toward the heart. This action effectively prevents blood from pooling. Electrical Muscle Stimulation (EMS) is an internationally accepted and proven way of treating muscular injuries. It works by sending electronic pulses to the muscle needing treatment; this causes the muscle to exercise passively. The Ultimate Foot Circulator uses Electrical Muscle Stimulation (EMS) applied primarily through two large foot pads to stimulate the soles of the feet. These gentle electrical pulses improve blood circulation and relax tense muscles, relieving joint and muscle pain. Delivers prescription-strength relief by relaxing stiff muscles, increasing blood circulation of health muscles, reduces swollen feet and ankles to help you get back to a normal activity level. Provides electronic stimulation for the feet and lower legs. AccuRelief Ultimate Foot Circulator is intended to stimulate muscles of the lower extremity in order to temporarily increase local blood circulation and to facilitate and improve muscle performance. Designed to treat: poor circulation, tense muscles, joint and muscle pain, especially swollen feet and swollen ankles. Works by electronic pulses to the foot or body muscles through foot pads or self-adhesive electrode pads. Includes AccuRelief Ultimate Foot Circulator unit, 4 electrode pads, lead wires, adapter, remote control, instruction manual, electrode placement guide and power supply. Not affiliated with REVITIVE Circulation Booster, Belmint, Naipo or MedMassager. If you have any questions about this product by AccuRelief, contact us by completing and submitting the form below. If you are looking for a specif part number, please include it with your message.